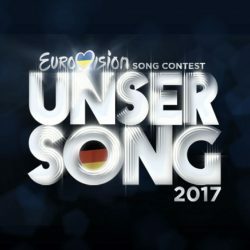 In order to select the German entry for the 2017 Eurovision Song Contest, public broadcaster NDR launched an ambitious national selection, featuring five promising young artists performing two songs specifically written for the 62nd Eurovision Song Contest. This year, for the first time ever, the international audience could participate via Eurovision Vibes, a new feature in the official Eurovision Song Contest app. Fans from around the globe were able to watch the rehearsals of the German national selection performances, as well as the live show via a live stream in the app and were then able to cast their vote. The host of the show, Barbara Schöneberger, shared the international Vibes with the German viewers throughout the 4 voting rounds. 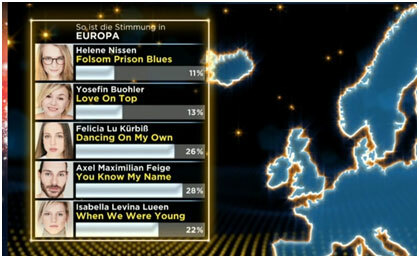 Using On-Air graphics the German TV audience had live insights into which act appealed most to the international audience. 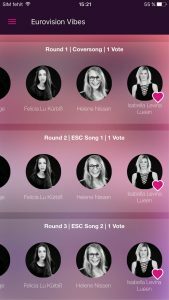 The national TV audience were able to follow the show throughout the official Eurovision Song Contest App and see lyrics, biographies and vote for their favorite artists. Finally the most popular act among Eurovision Vibes could also enchant the German voters. The world united in Eurovision Vibes – the song Perfect Live performed by Levina was the most inspiring act of the evening. Isabella Levina Lueen wins the German national selection and will represent Germany at this year‘s Eurovision Song Contest in Kyiv.